PeopleKeys, with the help of their various online assessments and workbooks, will give you the key to unlocking your child’s potential by revealing his unique personality and cognitive abilities. I recently had the opportunity to review the Student Strengths Report with my oldest son. 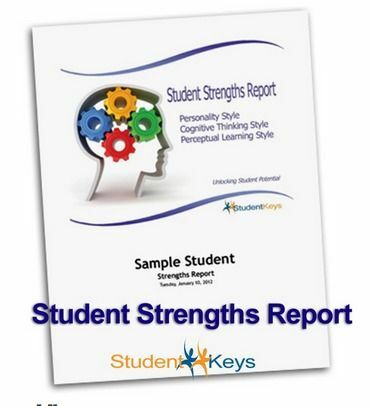 The Student Strengths Report is an online questionnaire that will instantaneously return a 34 page pdf summary on your child’s Personality Style, Perceptual Learning Style, Cognitive Thinking Style. My oldest son is 13 and just a year away from high school. He has often complained of having trouble learning certain types of material---we were both looking forward to reading his profile to get a handle on his strengths and help him navigate his future academics successfully. David took the online questionnaire. It was a painless experience. It asked me to leave him to it, which is probably good--- I sure hate it when someone reads over my shoulder when I’m trying to think, and I’m sure he does, too. The questions were of the type where he was rating what statements were most like him or what he was most likely to do in a given situation. He didn’t have any real difficulty completing the assessment, although there were a few questions he complained of as pertaining to things that were outside of his experience. Total time spent was maybe 15-20 minutes. I instantly had a downloadable pdf report. What did I get in the report? The report covers 3 areas: Personality Style, Perceptual Learning Style, and Cognitive Thinking Style. The assessment measures your child’s “energy” in each of these areas to determine his primary personality type and then names your child’s personality style, gives a one page summary of that style’s characteristics, and a chart showing his relative “energy” in each of the DISC areas. Several pages of the report are dedicated to explaining each of these areas, covering the characteristics of people particularly strong in each area and how this influences things like the intensity of their personality, communicating with other, and approaching tasks. None of this information is keyed to the taker of the assessment in particular, but it did give me a fuller picture since my son’s style seems so, well, mixed. The second part of the report focuses on Perceptual Learning Styles: auditory, visual, and kinesthetic. As you can see, David is a visual learner, with some kinesthetic tendencies (this confirmed what we knew already). The report gives some tips for visual learners to help out with things like taking notes, studying, and taking tests, plus suggested “tools” for visual learners (like mind maps, picture metaphors, etc.). Literal thinker is a very close second to Experiential thinker, however, other than the brief overview of the different types of thinkers, the only detailed information given is on Experiential Thinkers. Each of part of the report also has one or more worksheets your student can use to help him think about things like their idea learning environment or how different personality styles can affect how he interacts with other people, and so forth. There’s a lot of general information to wade through and a lot of it may not pertain to your particular child. I found it easiest to read my son’s summary in each area and then go back to read the more general information if I needed more clarification. Once I had figured out, I talked it over with David. We agreed that some of the things pointed out in his summaries were definitely true of him, but also felt that some things were not. Part of this is due to the limitations of creating a point and click assessment and providing an instant report that’s based on whatever values came back. It’s impossible to really figure out a person that way. Some of the suggestions are helpful and we’ll incorporate them into his learning, but I was a little disappointed that in both the learning style and thinking style areas, the report seems to focus on his highest scores without taking into consideration the other scores. I would like to have a fuller understanding of how, for instance, being a both a literal and an experiential thinker works as a whole. I’d also like to see suggestions for strengthening other modes of learning---it’s generally not in a student’s best interest to only rely on their strengths as he will often have to work in less than ideal learning environments. But, having these scores is definitely a step in the right direction and the DISC explanation of personality is pretty comprehensive.